We’ve had lots of glorious sunshine at last, in Roanne, but for many days of the last week we had storms with torrential rain which caused flooding in the region. 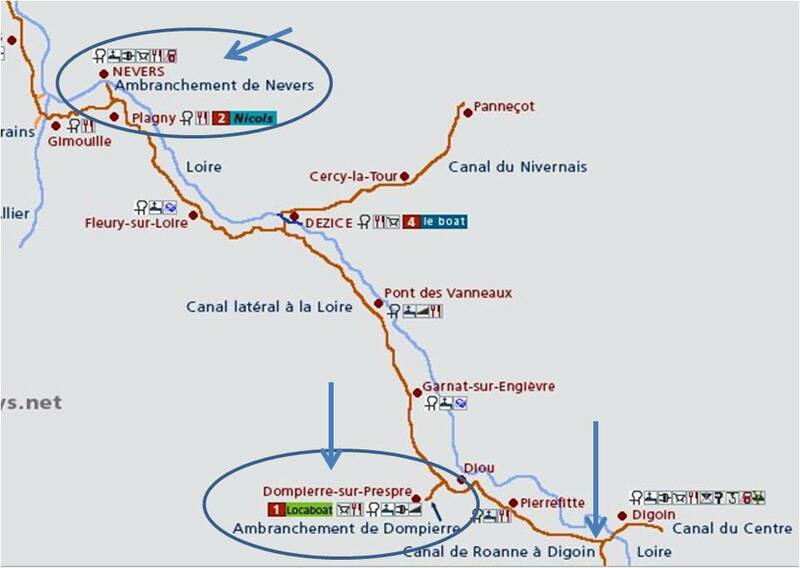 European Waterways map of where we are now: Roanne. There we entered the ‘dead end’ Canal de Roanne a Digoin. This is as far south as we will travel this year – so far, since leaving Paris, we have covered 446 kilometres. As well as the River Seine (88ks of it), we cruised the Canal du Loing (44.5ks), the Canal de Briare (54.5ks), the Canal lateral a la Loire (204ks) and finally the Canal de Roanne a Digoin (55ks). Vertically the 104 locks we’ve passed through have almost always been inching (centimer-ing?) ever upwards. So, we’ve been climbing, presently (at Roanne) 260 metres above the lowest point which was outside the lock on the Seine in our home port of Paris. 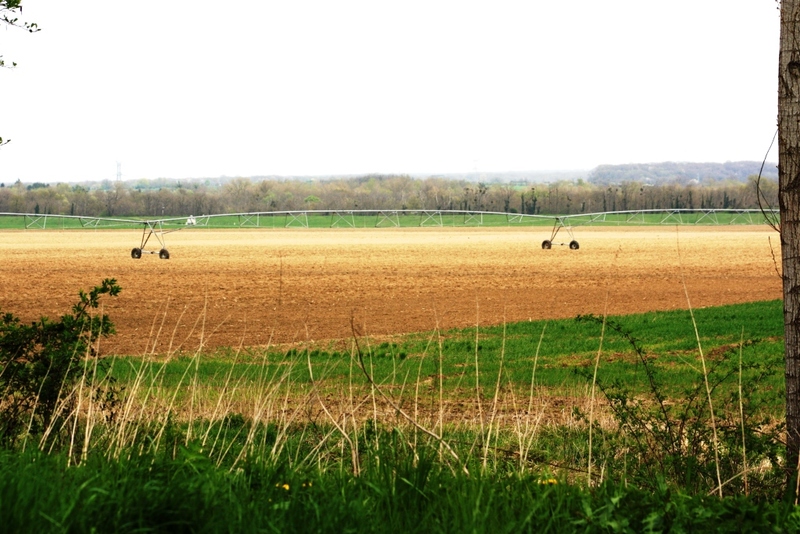 We see many irrigation systems but they stand by as large areas of Central France are flooded. We have clocked up 89 engine hours, and averaged just over 5ks for every hour the engine was on. Pretty good for ‘Endellion’ considering the currents were against her. We are about to see how we fare, going back down the stairs, though on a somewhat different route; along the Canal du Nivernais, a long-standing dream. Fuel consumption and average speed should greatly improve once we start the downhill section. Le Guetin aqueduct on the canal lateral a la Loire, crossing the river Allier. 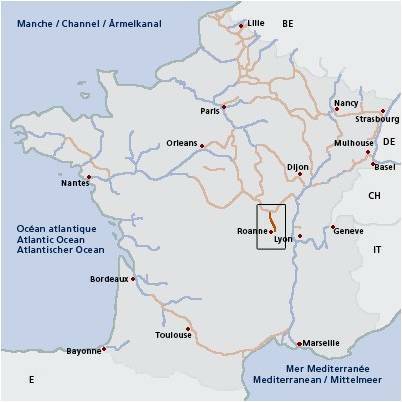 As we mentioned in our last blog there are many aqueducts (short and long) along the lateral a la Loire, and as we progressed the various rivers (Loire, Allier, Besbre) snaked under and around us always looking rather full. The old commercial peniches are now retired and the waterways are mostly used by pleasure boats. This region is very beautiful and the canals, at this time of the year, are incredibly quiet. The few fellow boaters we met were in small hire boats and heading in the opposite direction to us. The locks are all manually operated by the lock-keepers, something we hadn’t experience for a very long time. This means a lot more opportunity to practice conversation in French, as well as hopping off to assist in opening or closing a lock gate. A few conscientious lock-keepers were getting ready for the season. 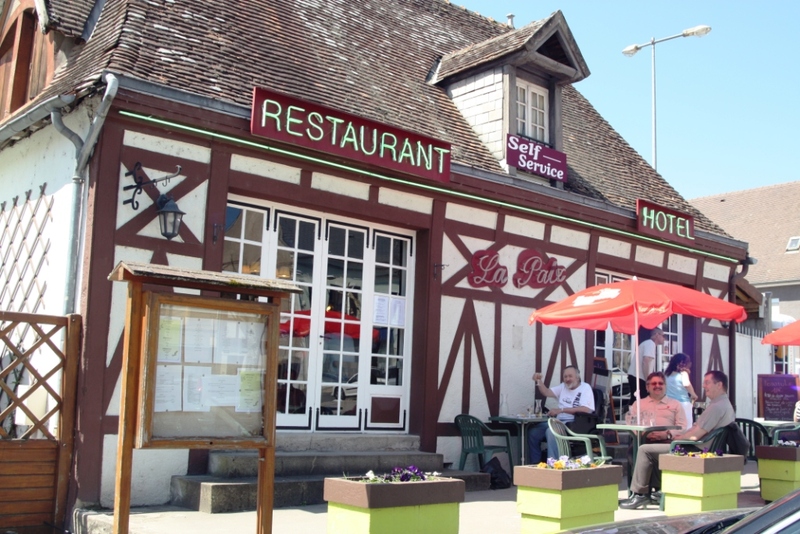 For example, at Houards (lock 36) we were offered Pouilly Fume or Sancerre wines from the local vineyards (Jean-Jacques Bardin or Les Chaumes at Pouilly). Yes please, we said, and I was taken into a small ‘cave’ (wine cellar) beside the lock and could choose from a range of six varieties. €7.50 or so a bottle. What a nice man, just what we wanted! And then at Peseau (lock 35), a beautiful setting with very healthy-looking hens scratching away in a large pen, I’m offered eggs. Yes please, I said again. €2. The view from the town of Sancerre, image from Cycling Loire as it was raining with no view when we visited! No sign of vineyards, just excellent agricultural land with tractors now busy. At the last lock for the day, no. 34, our egg man operated this one as well and asked whether we were going on again tomorrow. 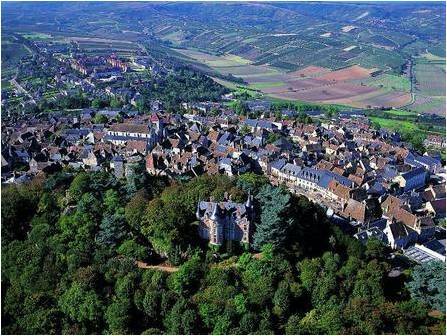 I said depending on whether we could arrange a taxi to visit Sancerre, two kilometres away up a steep hill. I will ring and find out, he said. And as we operated the lock between us he rang and hey presto, in theory, a taxi that will take a wheelchair will arrive at 10.00 in the morning, at our mooring at Menetreol, he said. 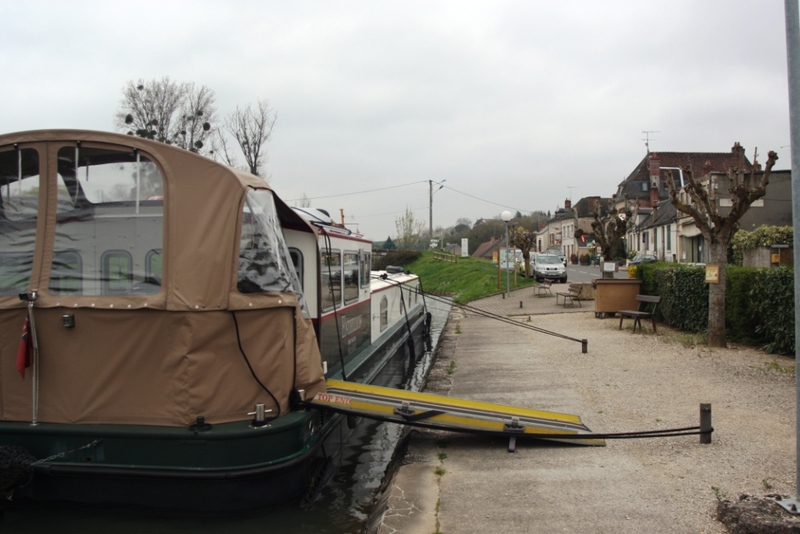 Endellion moored at Menetreol, around two kilometres from Sancerre. Well.. not quite 10.00am but at 10.30, just when we thought there was going to be no taxi (and after several calls to other services we’d Googled up), a small sedan-style car arrived: The taxi! Stewart somehow managed to transfer from the manual wheelchair into the tiny space in the front passenger seat, the driver and I folded the chair up and popped it into the tiny boot and off we set. Within a few minutes our driver stopped outside the tourist office as requested and charged €9.50, all good. The Tourist Officer had to move the bikes blocking the wheelchair entrance, unlock these special doors, remove wooden planks that were used to barricade it and then Stewart could enter. Fortunately, the one place we had in mind visiting was accessible (she confirmed): the Maison des Sancerre. We spent an hour or so there reading the French and English notes on wine-growing of the famous region of Sancerre, ending with a ‘blind’ tasting from one of the regional vineyards, with their compliments. We can’t tell you which one, the lady said, as it might show favouritism. 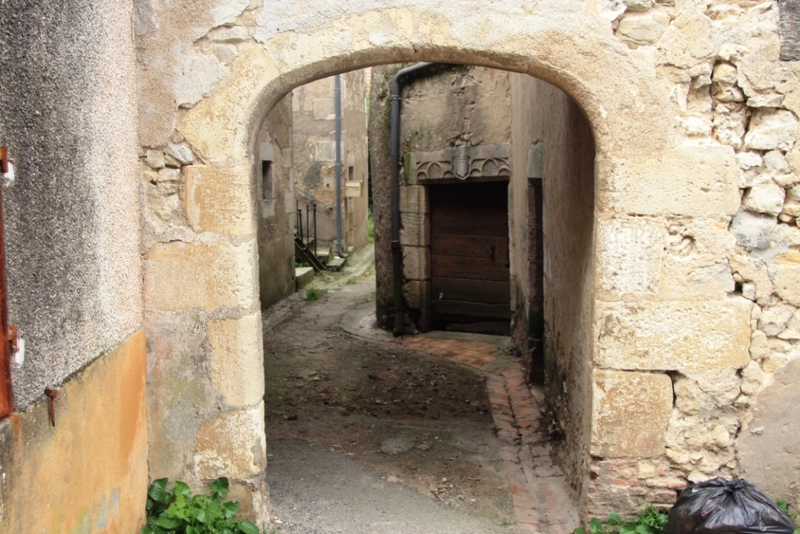 The medieval streets of Menetreol, a charming, quiet village near Sancerre. This was a difficult town for us, with its many lovely and ancient buildings but streets that were naturally steep and so with a manual wheelchair a bit too difficult to tackle. We had lunch at one of the few accessible cafes and they helped us organise the return taxi. However, it took an hour and more to arrive, he drove like a madman back down the hill and charged us €16.40! So for anyone attempting the same trip, a good idea would be to watch the meter as this man put it on way before we’d even got near the vehicle. On the wrong side of the bank! All along this route we found most locks ready for us with very efficient and friendly lock-keepers. Luckily we saw mostly only hire boats, who passed us heading in the opposite direction and at convenient places. Stewart had been having problems with the joystick (steering) getting stiffer and slower to respond than was normal so we planned to call in at Entente Marine near Gannay. Here we met owner Mark and his wife and within a few hours we had a new joystick and could get under way again. Stewart can’t believe the difference, it now works beautifully – and we were charged at cost for the part plus labour, very generous and a job well done. 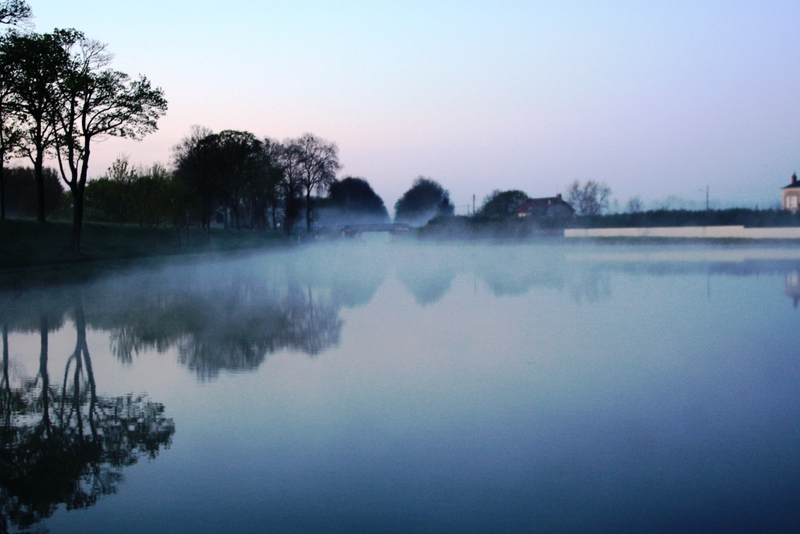 Early morning at the port of Nevers, one of our side-trips. European Waterways map showing our side-trips. 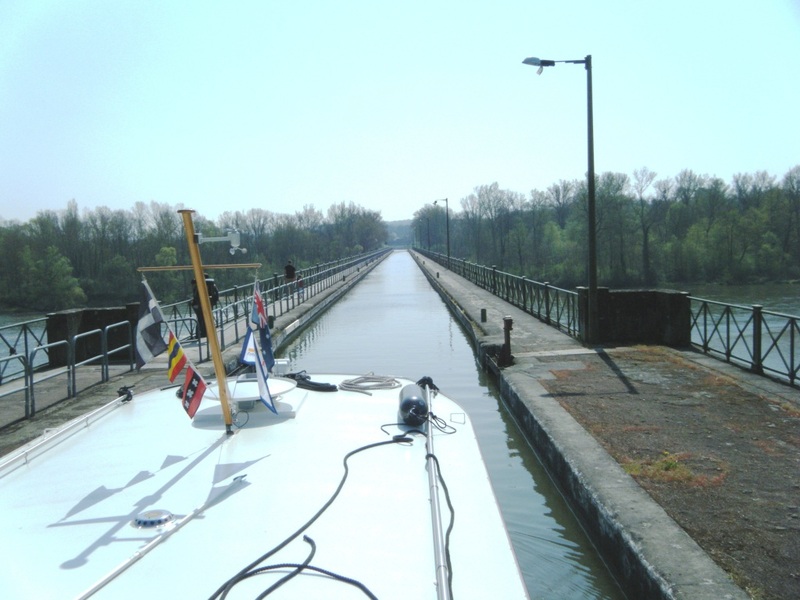 Between Briare and Roanne there are a number of side-trips (dead-end sections of canal) which we decided to take. 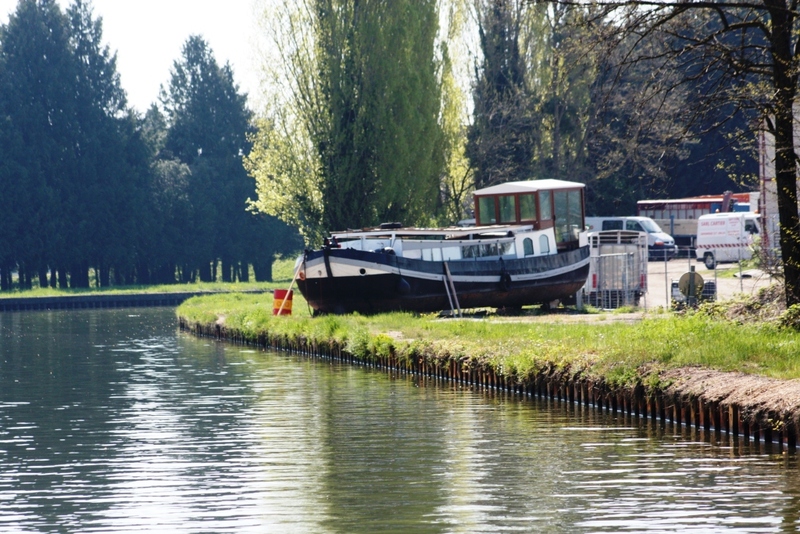 The first one was to Nevers, via the 2.8 kilometre Nevers branch canal, where the two locks are automatic (rare along this way) using pull ropes hanging over the water. This was a very pleasant port although in a commercial setting, ie, with huge shed-like businesses selling bathrooms, or tiles all along one side. There was no-one at the Capitainerie despite earlier sending an email advising of our arrival. A note on the door gave a telephone number, and when called a woman answered. The lady explained she couldn’t get to the port but could we please leave €10.70 for our 17 metre boat, which included electricity, in an envelope in the post box, which we did. 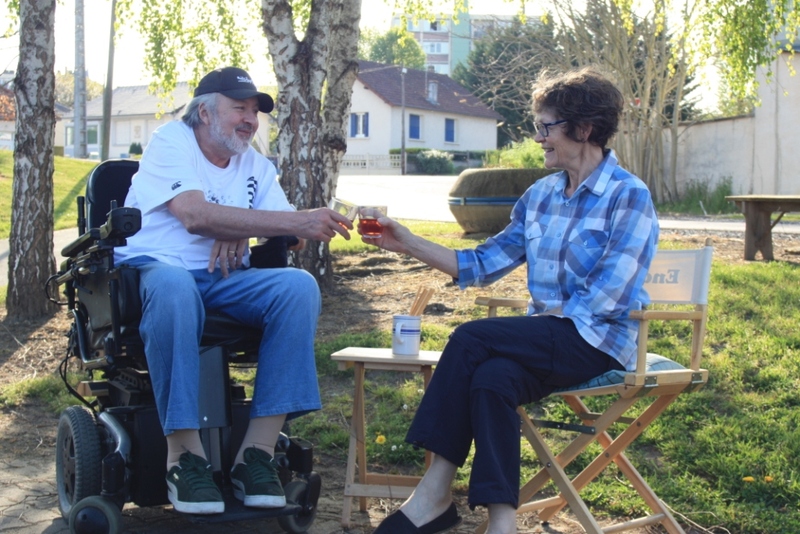 Sadly, we couldn’t get from the port to the town of Nevers because there was no easy wheelchair access, and our chair could not be trusted with a long or complicated journey. 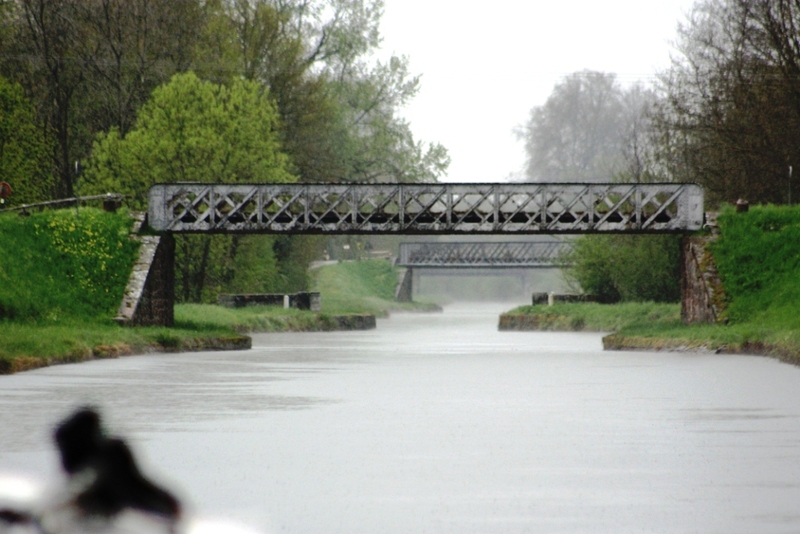 The Dompierre branch canal, delightful with small bridges and a narrow channel. 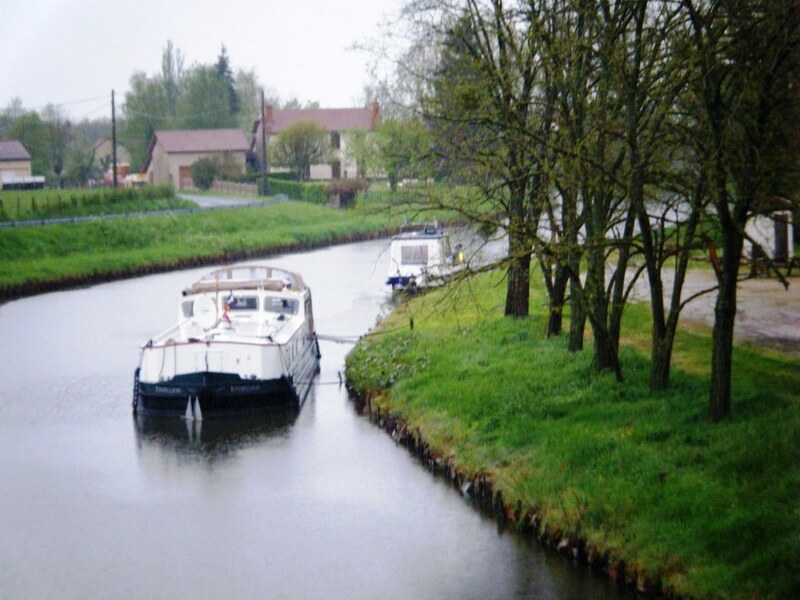 Our next detour was the Dompierre branch canal for the funny little place I’d read about in our guide: Dompierre-sur-Besbre. This was one of the narrowest canals we’d experience for a long time, sections could not be passed by two boats and the bridges were something like the Leeds to Liverpool in the UK, very narrow and low. At the end of the 2.7km stretch there is, thankfully, a good-sized port (with hire boat company) where Stewart did a brilliant job at turning and reversing into our mooring. An excellent lunch at the Dompierre Hotel Restaurant for €11 each. Then off to town half-a-kilometre away with the highlight being lunch at the only place with real activity: the hotel and restaurant littered with neon signs and set beside the supermarket. One of the signs said ‘Self-service’ .. and that was their business. It was really good, very busy… and at €11 each, including wine, we were delighted! 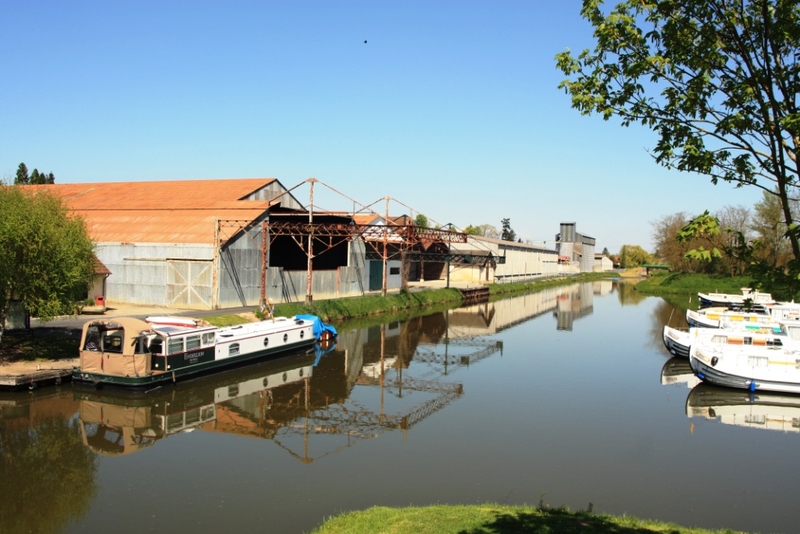 The last side-trip was our destination at Roanne along the canal de Roanne a Digoin. 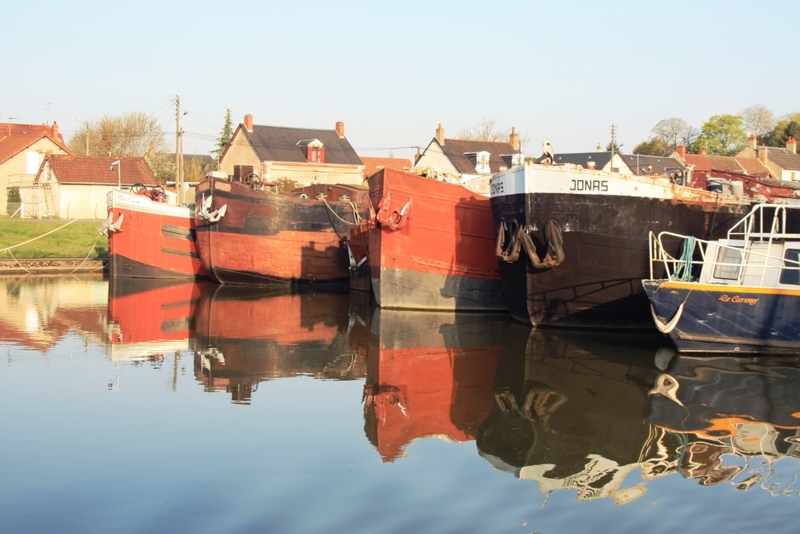 Roanne is the winter home to many Dutch-style barges mostly owned by British, Australians and Americans. These Dutch barges originally were commercial boats many built at the beginning of the last century and now converted to live-aboard pleasure boats. They are very special as you will see if you visit the DBA website. 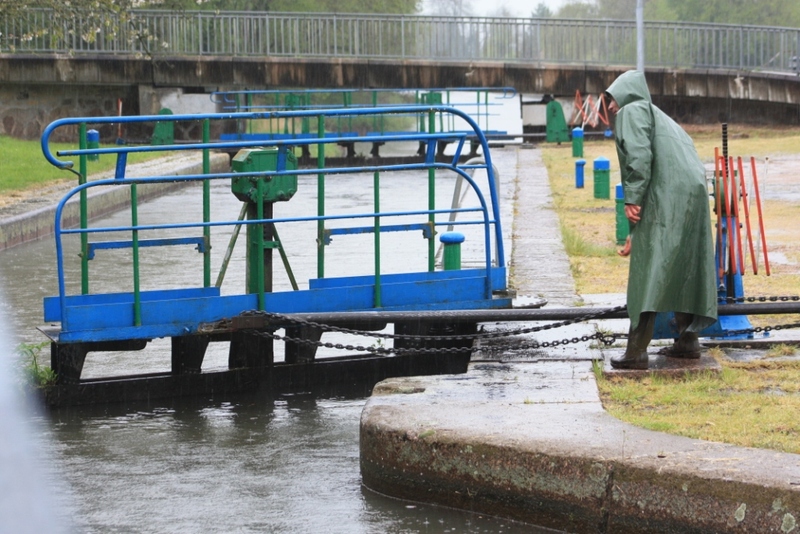 One of our lock-keepers operating the manual system, in the pouring rain. As if to demonstrate the approach of May, and the start of the boating season, we met a relative stream of them as they left Roanne. They called out as they passed where there were spaces at the moorings heading into Roanne, and where they were heading .. several off to join the DBA rally being held in Dijon in June. Bridges along the Roanne a Digoin canal. 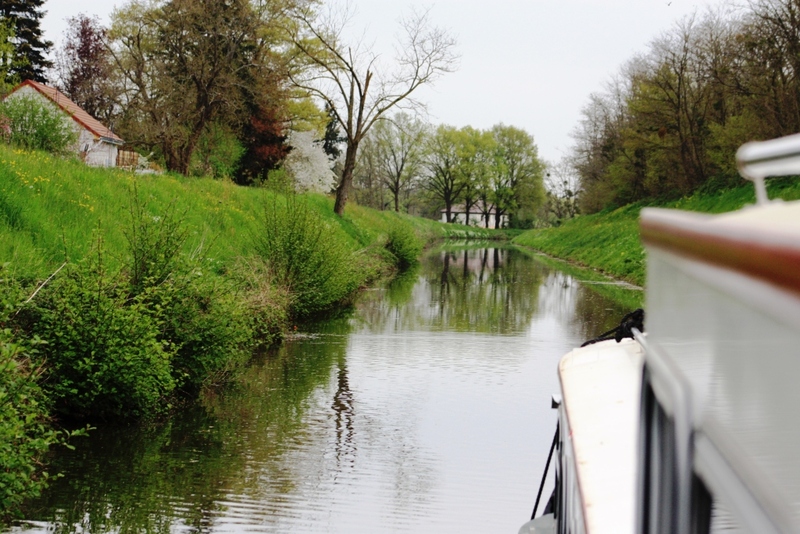 This was one of the quietest canals we’d experience, once the DBA barges were past us, with beautiful farmland stretching out until we could see the hills in the distance. There are only a few usable moorings along the 55 kilometres of this canal; many places are way too shallow even for our meagre 0.80 metres draft. Crawling along trying to find somewhere suitable in the torrential rain, and with darkness closing in, was not enjoyable. Endellion moored at Bonnant, one metre from the bank, not wheelchair friendly but a safe place for the night. Until at Bonnant there was a wooden jetty we’d read about in the DBA guide where it would have had the depth if it was free. But through the rain we could see there was a very well lived-in small cruiser tied off with an old man ignoring the rain happily fishing. He dropped everything (rod left carefully in place) and rushed to the bank giving us instructions on how and where we could moor along the bank. We couldn’t get within a metre of it because of depth but never-the-less we managed to tie off with the old man’s help. Then back he went to his fishing and little dog waiting on the pontoon. Endellion at the port of Roanne, behind the gorgeous 1885 classic Dutch barge (a Tjalk) owned by our friends David and Jane. 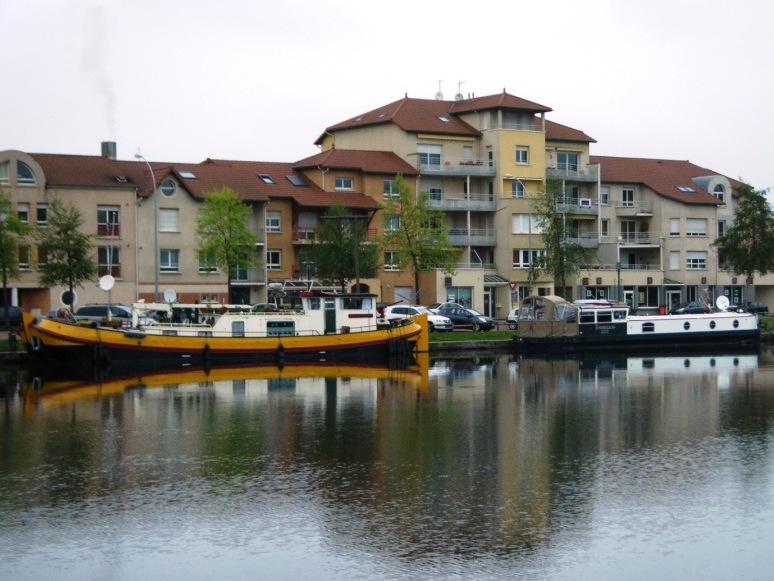 Finally we arrived in Roanne, on a Sunday, and it felt somewhat desolate – it’s a very large port, much bigger than the Paris Arsenal, with wide open spaces all around. We tried to follow the instructions the Harbourmaster had given us via email (the Capitainerie was closed that day) but found a classic Dutch-style barge (20 metres plus) in that exact spot. As we floated nearby scratching our heads and thinking we just had to find another place somewhere, we heard the English words, “Hello .. need help?” This was David (we found out later) on his 1885 Tjalk (really old beautiful Dutch barge) who told us we could safely moor behind him without offending anyone. This was the start of a great friendship. David and wife Jane have been using Roanne port for many years – he’s a very keen blues singer/musician and Jane is into art and their two black and tan dogs. Needless to say there were several musical meetings during our time in port. 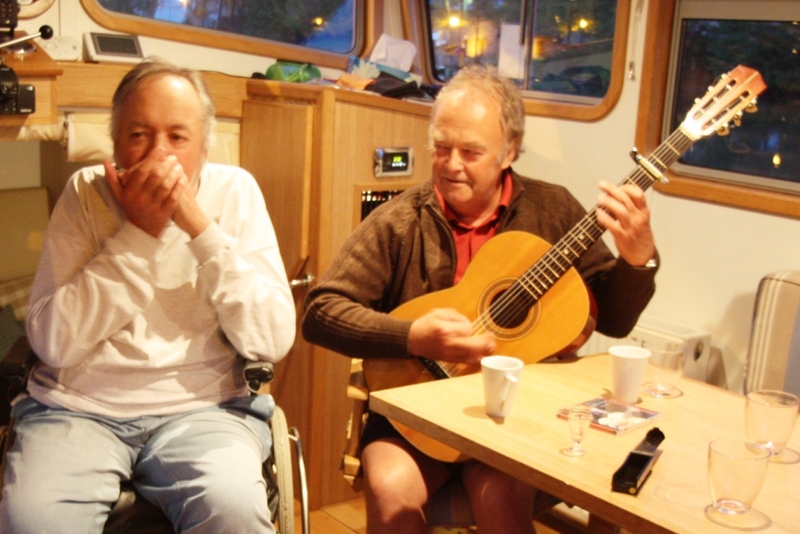 Stewart with his now treasured gift of David’s harmonica and David with his guitar. Roanne is an interesting city, there is next to nothing to do especially if you are a wheelchair user as the museum is not accessible, and the Tourist Office had no other suggestions to make. However, they have one of France’s best-known and most awarded (three Michelin stars) restaurants: Maison Troisgros. 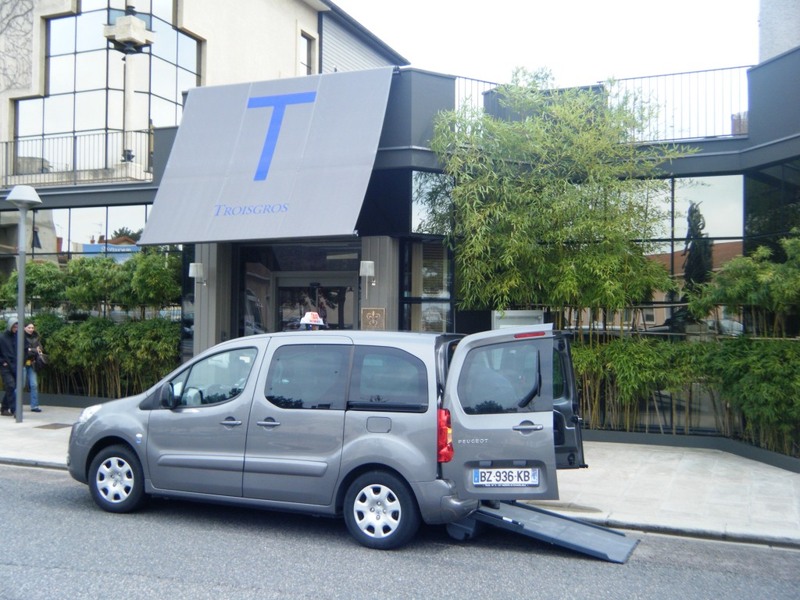 A professional, wheelchair accessible taxi in Roanne, and a three-star Michelin restaurant, Maison Troisgros. Normally we do not eat in Michelin starred restaurants, but almost in desperation for something to do during the ten days of waiting for our wheelchair to be repaired, it seemed a good idea. Although, when we mentioned this to our many new neighbours in port they shook their heads, “let me shake your hand” one cheeky friend said. It seems no one else has dared to test the expensive but world-class fare. So we booked a truly wheelchair accessible taxi*, one that Stewart could drive his misbehaving power chair into, and had one of the most glorious lunches for years. We kept everything to the minimum including wine and still found ourselves completely satisfied in taste buds and stomachs! Chateau Roanne with its ancient keep. As mentioned, this is a very popular winter mooring for many British, Australian (a surprisingly high number) and American boat owners. Similar to Paris, they organise social gatherings and one is every Thursday’s ‘Happy Hour’ at the port-side restaurant L’Authentique .. here we met our neighbours, those who hadn’t already left for the season’s tour. 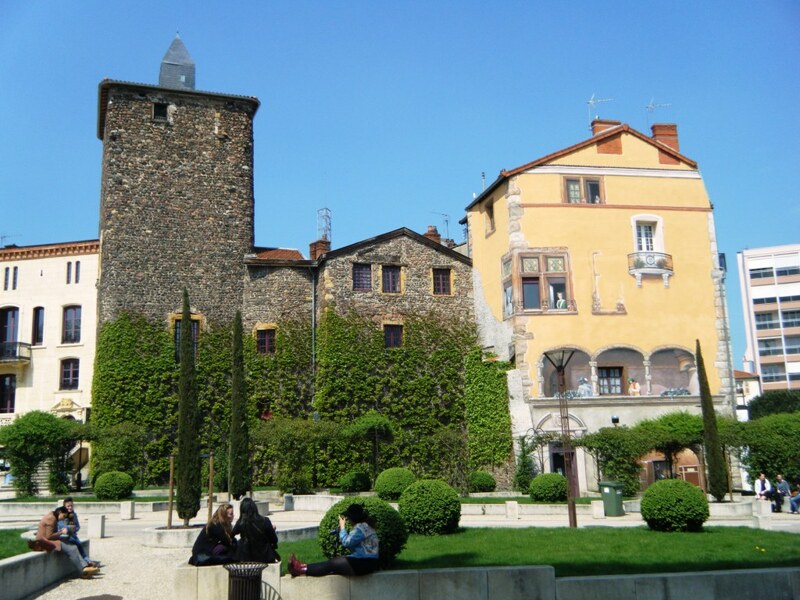 Our time in Roanne was a little like our experience in Briare, we found it one of the friendliest ports we have ever visited. One of the reasons we stayed so long at Roanne was difficulty organising Stewart’s power wheelchair repairs (mentioned in our last blog). After quite a story, we now have the new motor installed, all seems to be OK, but it’s still ‘fingers crossed’ we won’t have a repeat problem (more on this in our next blog). We’re now under way again, travelling back down the canal Roanne a Digoin, with plenty of sunshine and a few dramatic storms. Stewart and Lesley, very happy and toasting health and good cheer to all. We have several very important dates coming up, especially meeting our sister-in-law Pammie McLennan who has just arrived in this part of the world from Goulburn Australia. We’re a bit behind schedule for her time with us but think we can catch it up as we climb the first section of the canal de Nivernais .. as long as the rain holds off, and the flooded central France waterways can lift the bans which have been in place the past week. * Ambulance Charliendine: the most professional taxi we have found to date with every security strap possible and the most charming and conscientious driver. Tel: 04 77 60 13 93. Recommended. This entry was posted in Accessibility, Australia, Multiple Sclerosis, Waterway life, Waterway services, Wheelchair and tagged Boat services, Endellion barge, family and friends, Maison Troisgros, Nevers, Roanne, Travel, Waterway services, Wheelchair access, Wheelchair taxis. Bookmark the permalink. Very nice to receive your note, enjoy Amsterdam as I’m sure you will. It’s a great city, especially with a boat.